This important new book tackles the burgeoning revival of the blacksmith’s art. 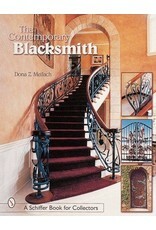 Author Dona Meilach has brought together over 500 works by nearly 200 artist-craftsmen from sixteen countries to illustrate the unprecedented activity in modern ironwork that has led to its blossoming into a serious art form. You’ll learn several techniques using hot and cold forming with the results clearly shown. You’ll be able to recognize how a fence, railing, grille, table, chair, knife, and other items evolve, and better appreciate their design and workmanship. Each chapter provides background for the type of objects shown– architectural ironwork, sculpture, furniture, containers and vessels, lighting fixtures and candleholders, fireplace accessories, wind vanes, household and liturgical items, and the incredible knives made of Damascus steel. You’ll find ample information for how and where to begin your own study in this extensive resource list of organizations, Internet sources, publications, museums, and educational opportunities. 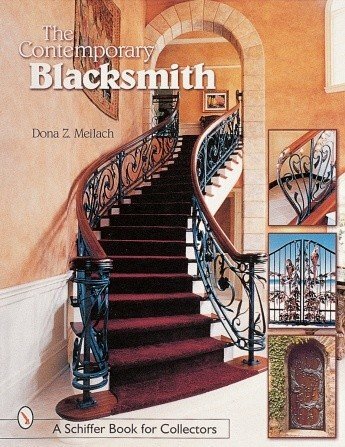 The Contemporary Blacksmith** undoubtedly should be found in the libraries of every metalworker, art educator, architect, interior designer, ironwares collector, and crafts person.